Electronic catalogs, it seems, are the wave of the future. What you used to have to cram into a 3" binder, can now fit on a CD the size of a business card! Using Adobe Acrobat® , E-catalogs can be created from any existing database or brochure complete with navigational pages allowing the reader to simply click on the graphic to get to the page/file desired. CDs can be duplicated in any quanity and printed using my inkjet CD printer/duplicator. It is essential to provide employees with reference materials such as e-mail and mailing addresses, phone and fax numbers, and who-to-contact information. We can help you develop these, and other reference materials, such as employee handbooks and company history. 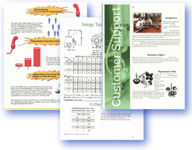 Reference materials can be designed for print, or electronic distribution.